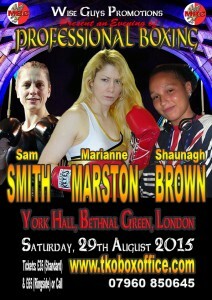 Female Boxing: Marston, Smith and Brown In Action In London, Aug 29th. Promoters Mark Lyons and Billy James-Elliott today announced that they have added two further Female professional bouts, in addition to the one already on the card, to their upcoming LORDS OF THE RING II event, which takes place at the famous York Hall in Bethnal Green, London on Saturday August 29th. Heading up the female contingent on the Capital City’s new season opener, is British #1 ranked (Super Bantamweight & Pound For Pound) and reigning MBC International Super Bantamweight Champion Marianne Marston. This will be the first chance for Marston’s fans to see her in action this year, as she suffered a relapse to the severely damaged piriformis muscle she tore during the buildup to the WBU European title challenge against Hana Horakova in March last year. Marston will be looking to be on her best form, now the injury is completely healed, as the Londoner has been lined up to challenge for a World title later this year. Joining Marston on the LORDS OF THE RING II event will be unbeaten Lightweight Sam Smith from Leeds and a fellow Londoner Shaunagh Brown, who will be making her professional debut. Smith, who fights out of the Bethlehem Gym in Leeds, has made quite a statement, since turning pro in March this year, scoring three stoppage wins as well as already securing her first Championship accolade, when she beat Zsofia Bedo by third round stoppage to secure the International Masters Bronze Lightweight title. 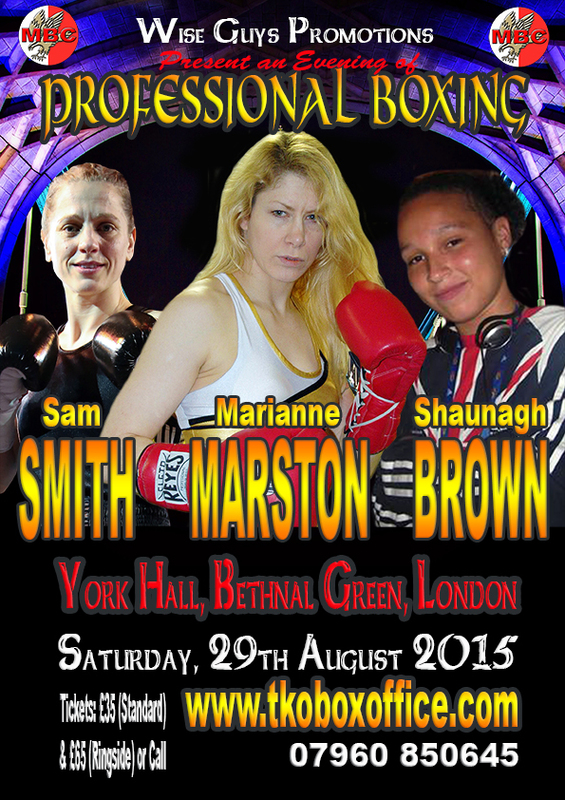 Making her professional debut on the event is Team GB Athlete Shaunagh ‘The Hammer’ Brown from Peckham, South London. Brown, who is coached by former Commonwealth Champion Mark Reefer at the Champions TKO gym in Hackney, has enjoyed enviable success throughout her athletics career, including winning the Gold medal (Discus) at the ESAA Championships in both 2005 and 2006, Silver at the AAA U20 Championships also in 2006. At the England Athletics U20 Championships in 2008, Brown secured not one but two medals in different disciplines, Gold for the Discus and Silver for the Shot Put. In 2009, at the Aviva England Athletics U20 Championships, Brown then added the Gold Medal for Shot Put to her collection. “This is the new season opener for boxing in London and we decided that new season, new start so what better than to bring to the fore some of the magnificent female fighters we have in this country. Without doubt it’s about time there were more female fights in the pro ranks, over the past few years about the only British female fighters that have seen regular action are Marianne (Marston) and Angel McKenzie, but now with Sam (Smith), Shaunagh (Brown) and others such as Juliette Winter coming on board, Women’s boxing can really start to gain some momentum. It’s unheard of to have three female bouts on a pro event in the UK, after the 29th August hopefully this will no longer be the case and we get to see these young women in action, as well as getting the media coverage they deserve. Marianne has more than proved she is Championship level and rightly has earned a shot at the World title later this year and I don’t doubt for one minute that Sam will also be challenging for major titles in the near future too, as will Shaunagh. Shaunagh has enjoyed success in the sporting arena previously, Discus, Shot Put and Hammer Throwing, both Nationally and Internationally, the girl’s a winner and am sure she will be just as successful as a boxer as she was is in her other chosen sports. It’s going to be a great event, besides the three female bouts, there’s a lot of great fights lined up that feature some top fighters, such as WBF World Champion Chris Goodwin, former Team GB star Iain Weaver and Jimmy Campbell, Jimmy has been in with the best of his division, such as World Champions Anthony Dirrell and Virgil Hill. 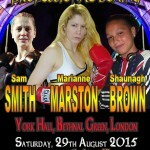 Posted in Uncategorized | Comments Off on Female Boxing: Marston, Smith and Brown In Action In London, Aug 29th.